These handy frigates are used for pursuit, convoy protection, commerce raiding and reconnaissance work and, when operating as a detached squadron, as a flagship for the admiral in charge. 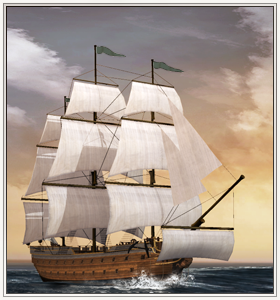 Excellent sailing characteristics, especially in inshore waters, make it a useful addition to any blockading fleet, and perfect for aggressive admirals. Accommodations for the flag officer and his small staff may be a little on the snug side, as these are fighting vessels with little spare room for many creature comforts. This is a footling inconvenience when considered against the chance to carry the fight to the foe! An admiral’s flagship, normally a somewhat staid appointment, is an excellent appointment for men who are hungry for glory – when that flagship is a frigate. Historically, the term “fifth rate” is a Royal Navy one, and applies to the largest single-deck frigates, mounting some 44 12-pounder guns. However, every navy that used European designs found a use for this class of vessel.